Trusty Chords, a new record store in Edwardsville, buys/sells/trades new/used vinyl, CDs, tapes, music memorabilia, and more. When it comes to figuring out the process and perfect location to open the first record store in Edwardsville in decades, look no further than Trusty Chords Record Shop, at 1514 Troy Road. Behind this musical venture are owners Colin Anderson and Scott Brunkhorst, who share common interests in music and entrepreneurship, along with the help from Greg Wilhelm. Anderson is a 2003 SIUE alumnus who earned a bachelor’s in business administration with a minor in music. He is ecstatic to be able to utilize his degree and share his love for music with the community. The Illinois Small Business Development Center (SBDC) for the Metro East at Southern Illinois University Edwardsville, provided Anderson and Brunkhorst with the support and information needed to smoothly start their new venture. Anderson met one-on-one for a confidential, no-cost counseling session with SBDC Small Business Specialist Marti Guntren, who provided referrals in financing, marketing and networking. The duo worked steadily toward funding Trusty Chords. Guntren was also there to coach, review their promising business plan and more. Anderson expressed his gratitude to Guntren and his overall experience with the SBDC. He credits the SBDC for steadily supplying information and support throughout the business start-up process. Trusty Chords will help others live out their passion for music by bringing back music in all formats. They will buy, sell and trade vinyl records, CDs, cassette tapes, turntables and record accessories, T-shirts, posters, books, collectibles, and just about anything else music-related. The shop will appeal to consumers who love the tangible music product. 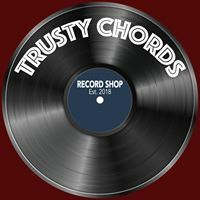 The Illinois SBDC for the Metro East assists start-up ventures like Trusty Chords Records Shop as well as existing businesses headquartered in the nine-county region of Calhoun, Jersey, Madison, Bond, Clinton, St. Clair, Washington, Monroe and Randolph. It is funded in part through a cooperative agreement with the U.S. Small Business Administration, Illinois Department of Commerce and Economic Opportunity, and SIUE, as a service to Illinois small businesses.